In December, Good Shepherd UB in Huntington held its 15th annual Christmas Give-a-Way via the Shepherd’s Closet clothing ministry. A total of 210 grocery bags filled with shopper’s choice of clothing, gift items, toys, books, shoes, and hats were given away. The Shepherd’s Closet, located in the church basement, is open to the public year round for clothing for a small donation or for free, depending on the need. Michael and Kim Hewitt are the parents of a baby boy. Andrew Michael Hewitt was born January 14, weighing 7 lbs., 10 oz. Michael is youth pastor of First UB in Blissfield, Mich.
Ricardo Rivera is the pastor of a new Hispanic church being planted in Sacramento, Calif. Ricardo holds an local conference license. The new church is using the facility of the Faith Christian Fellowship UB church in Sacramento. “Since the Warlpiri Bible dedication in October 2001, I have continued on in my administrative and consultative roles within the Branch, but in all honesty it has been more out of a sense of duty/obligation than of call, at least not such a call that saw us come into Wycliffe in the first place in 1975 and then to Australia and the Warlpiri people in 1978. Perhaps we missed God’s signal to move on to other things in late 2001, but regardless of that, Bev and I now feel that it is God’s time for us to move on from Wycliffe and into something new. “What does this mean for us? Wycliffe Australia has graciously allowed me six months leave commencing December 1, 2003, and I have appreciated the time thus far to get some extra R&R. However, beyond that, it is our intention to take formal Leave of Absence (LOA) from Wycliffe at a time not yet determined, but which may be in March or April of 2004. We cannot be certain of the future, but our current intention is to eventually resign from Wycliffe. LOA leaves the door open for a return to full service within five years should Bev and I choose to do so. Once we move into LOA status, we are allowed to receive support donations for a further three months from the commencement of LOA. “In addition to this, after a brief and intense job search, I found and accepted a position at Yirara College (the same place Bev has worked as a tutor) as Executive Secretary to the Principal, the Business Manager, and Assistant Principal. I commenced work on January 19 and am confident that the Lord has opened up this job for me and that I can both handle and thrive in it in the long term. At the time of writing this letter, I completed my first full week of work and thoroughly enjoyed the job and the people I work with. “It is not at all easy to write these words to friends and family who have prayed for and supported us, who have struggled our struggles and dreamed our dreams, who have laughed and wept and rejoiced with us and the Warlpiri people for these last 25 years that we have lived and worked in Australia. We owe each and every one of you more thanks and credit than we can ever give or repay. We know for certain that anything we have accomplished for the Lord here in Australia has been your accomplishment as well, and we praise and thank God for you all. Rev. Darren Duncan (right), a minister in Central Conference, is currently serving as a chaplain in the United States Air Force. He is deployed at an undisclosed location. 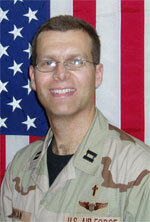 Darren was pastor of the Living Word Church (Columbus, Ohio) prior to going on active duty in the spring of 2003. Darren reports that his worship services are packed and that hearts are very receptive to the gospel where he serves. Jana, director of the Macau Mission, sent the following on February 21. Pastor Karis Vong from Living Water Church had a healthy baby girl this past week. Praise the Lord for this precious addition to our team. Pray for Lawrence and Karis as they adjust to parenthood. Please pray for Pastor Connie Sung from Living Word Church. She was hospitalized recently with stress-related health problems. She is now back to serving in the church. Pray for wisdom as she considers how to adjust her ministry. English Language classes began last week. Enrollment has increased some over last term, and there seems to be a more “upbeat” atmosphere. Praise the Lord for answering prayer in these areas. Pray for Helen, Ronald, Miss Cheong, Grace, and Duong–all non-Christians who are attending English Bible Studies and seem to be sincerely seeking to understand God. Mt. Pleasant UB church. The new addition is on the far left. Jennifer Blandin’s maternal grandmother passed away on Tuesday, February 10. Pastor Ron Ramsey, Pastor of Main Street UB in Walbridge, Ohio, writes, “She was 92 and was a faithful believer since she was 10 years old.” Jennifer came back to the States for the funeral, which was held February 14. Luanne Brooks, a UB missionary serving with OMS in Haiti, returned to the States on Saturday, February 21. On February 19, she had sent this email to her supporters. “This is a very difficult letter for me to write, but here goes. I am coming back to the United States and I have no idea for how long. The situation here in Haiti is completely unstable. Our compound is now down to five missionaries. Please pray for Haiti. So many wonderful people here that are trapped and cannot ‘go home,’ because they are home. “If you are supporting me financially, I ask that you do not stop. If there comes a time that I believe that I will not return to Haiti and that the Lord has released me, I will let you know immediately. As of this moment, I want to return and do the work the Lord has given to me to do. If you would like me to come and speak to a group, church or missions conference, please contact me right away. I would be glad to come and share. Hillsdale UB (Hillsdale, Mich.) bought out three showings at the local theatre of “The Passion of the Christ.” Pastor Lester Smith sent a note on February 19 saying, “Because we bought all 200 seats (600 tickets in all), they gave us a good discount. It was a 2,500 investment and we’ve gained back more than half already after we presented it as an application to my sermon last week. One man has offered to pay for 100 tickets to be given away to youth in our community.” The first showing will be Thursday, February 26, at 7:10 pm. They are promoting it as “Youth Night.” The other showings are on Saturday, February 28, and Monday, March 1. Hillsdale had David Meece for a concert in during the worship service on Sanctity of Human Life Sunday, which was January 18. They put out all of their chairs for the first time, and attendance topped 650. During the past few years, Hillsdale converted their gym into what is now the largest worship facility in the county, with 680 seats.